Explains how the forms of terrorism affect the post-9/11 security environment and how weapons of mass destruction could give terrorists short-term, asymmetric attack advantages over conventional military forces. This book focuses on key dimensions of the WMD threat to critical in... read full description below. 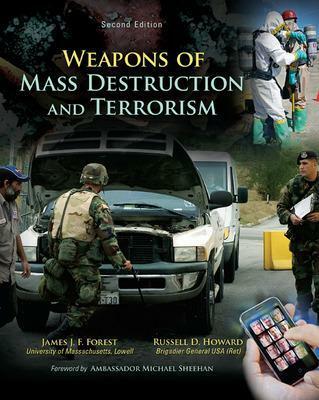 In WEAPONS OF MASS DESTRUCTION AND TERRORISM, 2/e, Dr. James Forest and Brigadier General (Retired) Russell Howard have collected original and previously published seminal articles and essays by scientists, academics, government officials, and members of the nation's security and intelligence communities. The editors and several of the authors write from practical field experience in nonproliferation and counterterrorism efforts. Others have had significant responsibility for developing government policies to address the threat of weapons of mass destruction and terrorism. The contributors include many significant names in the field including Bruce Hoffman, Ashton Carter, William Perry, Brian Jenkins, Jonathan Tucker, Charles Ferguson, David Albright, Gary Ackerman, and Gregory Koblentz. Unit I of the book introduces key terms and addresses important strategic and policy debates. Authors explain how the new forms of terrorism affect the post-9/11 security environment and how weapons of mass destruction could give terrorists short-term, asymmetric attack advantages over conventional military forces. Unit II offers detailed accounts of the characteristics, availability, and dangers of specific types of WMD, along with five case studies that associate theory with practice--an important feature of this volume. Unit III is focused on key dimensions of the WMD threat to critical infrastructure. Unit IV deals with past, present, and future national and international responses to--and defenses against--the threat of WMD terrorism. And in the final section of the volume, authors provide several analytical frameworks for predicting future WMD threats, and draw from historical events to identify lessons and strategies for the future. Appendices include U.S. national strategy documents on countering terrorism and standards for controlling WMD materials and technologies. Dr. James Forest has published over a dozen books and teaches courses on terrorism and homeland security for military, law enforcement, and civilian programs. Brigadier General (retired) Russell D. Howard is an American veteran Special Forces officer, academic, tutor, writer and counter-terrorism strategist. He was the founding Director of the Combating Terrorism Center at West Point and Co-Editor of four McGraw-Hill terrorism focused books: Terrorism and Counterterrorism with Dr. Bruce Hoffman, Weapons of Mass Destruction and Terrorism with Dr. James J. F. Forest, Homeland Security and Terrorism with Dr. James J. F. Forest and Lieutenant Colonel Joanne Moore, and Defeating Terrorism with Lieutenant Colonel Reid L. Sawyer.